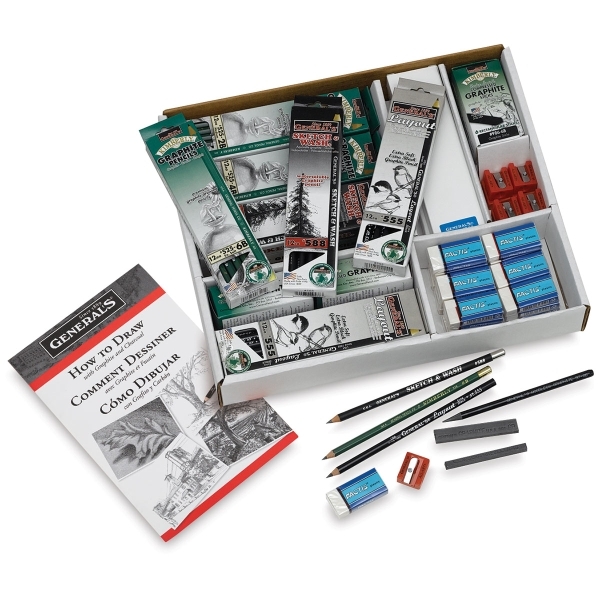 This versatile Classroom Art Pack contains 24 Sketch & Wash pencils, 72 Kimberly Graphite pencils (24 each of 2B, 4B, and 6B), 12 woodless graphite pencils, 24 compressed graphite sticks (12 each of 4B and 6B), 12 All-Art sharpeners, 24 plastic erasers, and a Learn to Draw Now book. The pencils are Carbo-Weld bonded for added strength and reliability. The compressed graphite sticks are handcrafted with the same smooth drawing formula as the drawing pencils. ® General's is a registered trademark of the General Pencil Company.® Kimberly is a registered trademark of General Pencil Company. ™ Art Pack, Carbo-Weld, and Learn to Draw Now are trademarks.